Six weeks ago, Facebook announced they would enable users to download the entirety of personal profile on the network - a big move for the company often seen as being "closed" when other sites have attached themselves to phrases like "open" and "portable". The promise was that content you put into the system could be easily retrieved, from your own personal profile (or Wall) to your photos, videos and even the friend list - while that famously does not contain e-mails, and has been at the heart of a data tug of war between the company and its occasional nemesis, Google. The data comes as a ZIP file which expands into simple HTML pages, with each major section of one's Facebook experience hosted as browsable directories. In fact, the data is easily expandable and movable that you could choose to replicate the Facebook profile experience on your own site, simply by uploading the content to a server under your control. Eager to try this, earlier this week, I set out to get a local copy of the data I put into Facebook. Not a tremendously active Facebook user, I didn't imagine it would be a huge mass of data, but it did weigh in at a compressed 31 megabytes, complete with a pair of short videos, and 13 photo albums, including "Wall Photos", "Mobile Uploads" and "Profile Pictures". 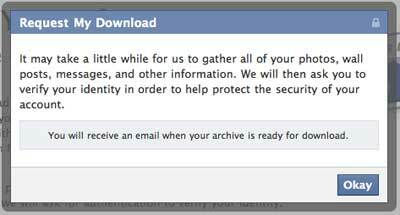 The first thing to note upon downloading and expanding is that when Facebook says they let you download all your info, they aren't messing around. The index.html file shows the data you list on your wall, from your real birthday and spouse info to religion, political party, employer, and interests (such as all those Likes you have racked up). This you probably anticipated. But it also backs up all your messages, so you now run the risk of downloading entire e-mail message threads from friends and posting them live for all to see, making the private public. If you do choose to upload this content somewhere outside of Facebook, the major heft of the content is on the "Wall", which is not paginated by length at all - so you can expect it to weigh in at several megabytes. Mine hits more than 7, but you can embarrassingly scroll down to the bottom of my Facebook history, when I joined late July 20th, 2007, updating my first status to read "wondering why he's looking at this facebook stuff and considering getting out before it's too late...", following on the next day, adding, "Any activity I have here will be met with serious resistance on my part. I see Facebook more like the MySpace and Geocities of the future than a serious Web platform, especially as it's password-protected and outside the range of Google." Looks like I was wrong on that one. Point Zuckerberg. As one's Wall can be impressively long, it actually can be fun to search for keywords posted over the lifetime of one's Facebook use. You can also scan quickly and see what applications you may have used and abandoned. In addition to Profile, Wall and Messages, there are top level directories for Photos, Videos, Friends, Notes and Events. Photos and Videos are self-explanatory, providing the option to back up your rich media, while friends just lists your friends in alphabetical order by first name. Your Notes are included and Events shows those Events you said you participated in. 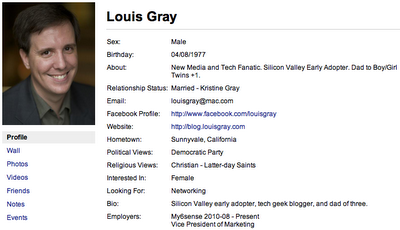 In the interest of sharing, I downloaded my Facebook details and posted them on my own site. You can find my full experience at http://www.louisgray.com/facebook if you are curious. I removed Messages for obvious reasons, but the rest is there. Of note, according to an interview with the LA Times, the project was the last one worked on by FriendFeed cofounder Paul Buchheit before he left the company to join Y! Combinator - and not the revamp of Messaging many people thought would be under his umbrella. 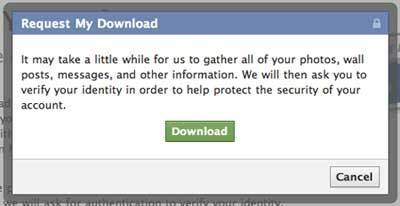 Getting one's data out of Facebook is a good thing. It doesn't mean they don't still have it, unless you were to close your account, but the idea that one's posted content and personal data is available to the author is the right concept.